On Tuesday, the BigTrends Grand Slam Options advisory locked in a 58% gain on a call trade entered on Monday of last week. Namely, we bought into some Visa (V) September (monthly - 09/21) 148 calls (V 180921C148), paying an average of 99 cents, or $99 per contract. We sold the whole shebang on Tuesday of this week at $1.57, or $157 per contract. Our profit? A solid $58 for each $99 call we bought upfront, in just a little over a week. Not bad for a short-term trade. Though we would have certainly like to have garnered a triple-digit gain, the fact of the matter is a triple-digit option winner is a pretty rare thing unless you're willing to take big risks that could eventually wipe out your portfolio. The Grand Slam option service is meant to minimize risk and maximize the reward we have a chance of reaping relative to that risk. We'll gladly bank a 57% gain that at least gives us a shot at a true 'grand slam' kind of gain that doesn't force us to take an uncomfortable 'swing for the fences' kind of position. To that end, the Visa call trade provides an excellent example of some of the things about option trading that just can't be taught in a textbook. Let's go over how this trade took shape, and discuss why we chose the 148 calls above our other choices. And, let's also take a look at the chart so you can see exactly what we were thinking every step of the way. In fact, let's start with a look at the chart of Visa first. Above all else, the option trading game is still about making the right call about a stock or index's future direction. What you're about to read isn't going to explain the basis of our trade in its entirety. You will get the gist though. In short, as of Monday, the 27th, Visa shares had rekindled its bigger-picture momentum. On the Friday before, shares broke to a new high above $43.27, and on the day of, followed through to the upside. 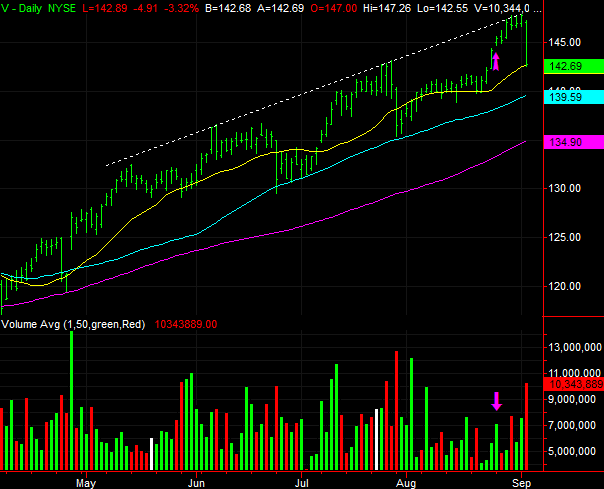 There was also plenty of volume behind that day's bullishness... the missing ingredient up until that point. The entry bar is marked with pink arrows on the image below. This wasn't a setup, however, that we knew had a ton of upside. Though the potential for a breakout was in place, we primarily liked it because the odds against a pullback were low - at least from our entry point. In the grand scheme of things, there was a ceiling around $147.66 (white, dashed) we knew would likely be a problem. We just wanted to give ourselves a chance at being in a trade in front of the potential breakout; we were always prepared to pull the plug if V stalled at the established ceiling. 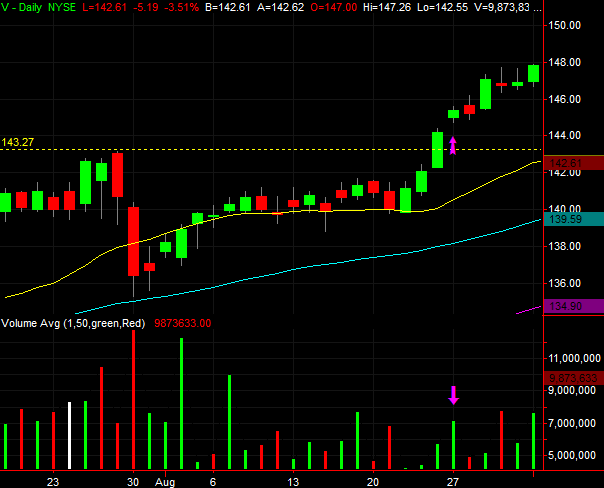 And, we felt confident enough that Visa wouldn't backslide right after we stepped into the bullish trade. Once those parameters are established, it becomes much easier to select a call option that optimizes the risk and reward of a particular trade. A realistic upside ceiling of $147.66 and a stock price of $145.27 at our time of entry isn't difficult math. That's $2.39 worth of potential, and even plausible, movement. From there we can start to make some reasonable assumptions about which option to trade. Also, we know that given the chart's history that this is a trade that will take a few days to pan out. And that may set the stage for an idea that's too often overlooked. That is, it's tempting to buy an option that expires in just a few days. In this case, call options expiring at the end of the week in question - the 31st, in this case - were available. 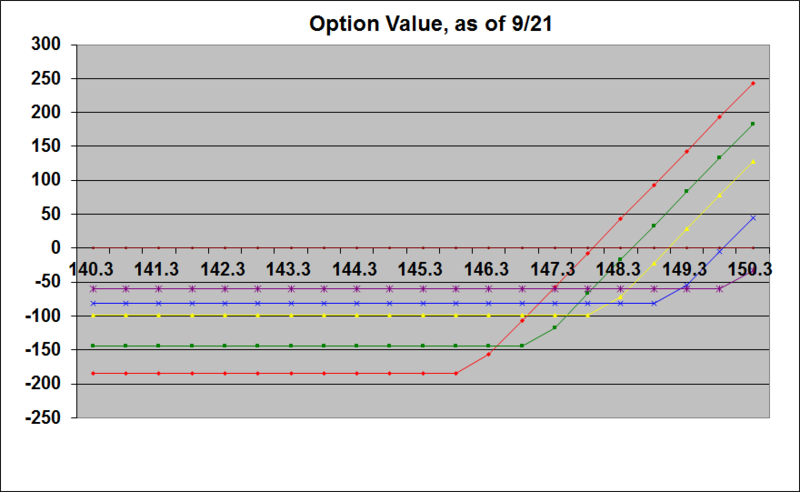 Those options were the most responsive at the time, meaning that 8/31 call options would give us the most bang for our buck in an effort to reap as much of that $2.39 worth of potential (the highest 'delta'). That's not necessarily the optimal choice here though. It always pays to buy a little more time than you think you might need, because you may end up needing it. It's also worth noting that while the 8/31 calls came packed with the highest delta, they also included the most 'theta', or time decay, that was going to work against is in a big (and accelerating) way. In this case, we bought the monthly September calls, which would expire almost a month later. We're glad we did. As for choosing the right strike price, that can be a bit trickier. To make an informed decision we really have to take a step back and look at all the profit-and-loss scenarios at our disposal. It's easiest to do this with a chart. That's what the graphic below shows us.... a P&L scenario for all the September (9/21) calls with a strike price near the then-current price of $145.27 Visa shares were trading at then. Each color of line is a different option, ranging from a strike price of $146 to $150. Care to guess which one is the $148 strike? It's the yellow line. It was the third-riskiest option in terms of potential loss, and the third-best option in terms of potential. Take a second, closer look at the image though. The 148 strike's maximum loss wasn't that much greater than the 147 strike's (blue), but that strike's potential gain was notably higher than the fourth-best option... the blue line, which represents the 149 strike's profit and loss potential. Said in simpler terms, the 148 strike had a lower risk-to-reward ratio than any other call option available to us at the time. In some ways the graphic oversimplifies the nuances of selection options. One piece of information missing is the entry price, which changes for each option and therefore changes the overall risk-versus-reward scenario - in percentage terms - for each of the five call options in questions. On a total-risk-versus-maximum-reward ratio basis though, the 148 strike was still the optimal choice. We wouldn't have known that, however, unless we were able to compare all the choices at our disposal. It's admittedly not easy or feasible to look at the upside and downside of all options in all possible scenarios. But, the more you do it, the more you don't need to go all the way through the exercise. You reach a point where you have an innate feel for how the P&L scenarios will take shape. If you'd like to earn as you earn by watching how Price does it, the Grand Slam Options advisory service is a great way to start.